Just got mine. Seems very good quality. Everything looks top notch. Connectors, cables, wrapping etc. Arrived charged at 80% as expected. I think those are pretty good readings. Discharged the battery to 60% then charged it fully. It absorbed 1536mAh of charge. The most I ever saw my stock DJI 2200mAh battery take was about 700 so I'm expecting 2 to 3 minutes extra flight time. That white tab is a pull tab for convenience. A nice touch. I'll test fly the battery in the next couple of days and will post the outcome. Overall it looks like a very good battery and I'm hoping the flight test bears that out. I'll also post back down the road 6 months and a year from now to report on the endurance and longevity of the battery. Open the bay doors HAL. . .
Been using the 3000mah Black Magics since May or so. They are great batteries, but do need to be cared for. No overdischarging and be sure to keep them partially discharged for storage. I routinely get 11-12 mins flight time to 11.1v. Only now are they beginning to show signs of wear, and slight puffiness when they are fresh out of the copter. They shrink back down to normal once cool. Chocolate maker in the hot tropics. Too many danged birds to list here. Did you check the cell resistances new and are you tracking the rise in resistance ? I guess the only way to really tell how much better they are for my setup, is to try them. At the moment my P1.1.1 is only loaded with a CF isolation mount and an attached 70g Mobius camera and I routinely get around 10 minutes (per stock battery) per flight going down to 11.2v. Eventually the payload will go up somewhat, when I add a 2D (or 3D) gimbal but that won't probably happen until next spring. In the interim, I'm going to be figuring out how to add an 3W COB LED tail light that I think I can switch on and off in flight using the open 7th channel normally reserved for gimbal tilting. Ok, first flight with the new Battery today and I do have some things to report. 1). I think the heavier battery (168 grams vs 192 grams) seems to have induced some video jello. Never really had any before but I do think the P1 is working harder to lift the battery and it's causing some resonation on the props. (I can hear it). That's causing the jello I believe. I may need to add a damper for the camera or try balancing the props. 2). Flight time - Only 8:45 but I have my first battery safety set at 11.6 I believe. It "seemed" to fly about 2 minutes longer than usual but I have to do some more timings. I'll have to do more comparison flights with the old vs new battery to be certain. I land when the first red light comes on. Also, sometimes new batteries need some conditioning to reach max capacity. It may gain another 60 seconds or so after cycling. We'll see. I'll report, you decide. Interesting side effect about the jello... wouldn't have guessed that would happen. Unfortunately, I think adding weight in any form will end up being a deal breaker for me. The P1 doesn't have much operating leeway when it comes to weight, so unless I "REALLY" want some extra bells and whistles, I'll probably shy away from larger batteries. From these early results I would not recommend the BlackMagic 2700mAh battery. I will do more tests and report back. It's "possible" the battery is still in a state of lowered capacity and I need to do some discharges to about 10% then fully charge it a few cycles. I'll probably do the next tests after I've cycled this BlackMagic battery 3 or 4 times. Your stock battery time is very much in line with what I get. 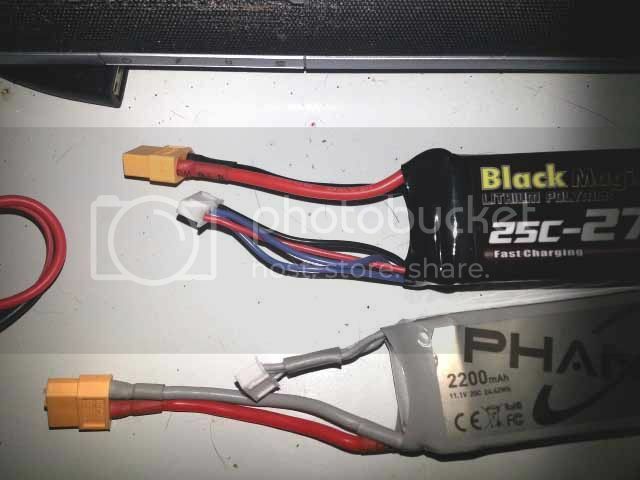 Well, dissappointed to say that even after cycling the battery several times to try to recoup some potential lost mAh due to cell imbalance etc, I still can only get the EXACT same time from this "2700mAh" battery as I get with DJI OEM 2200mAh battery. So you get the same flight time, but 24 extra grams to lug around. Doesn't seem that 24 grams should cost two minutes of flight time? 10 minutes was what I was expecting vs the 8 minutes for the stock 2200mAh battery. In addition, the battery got severely stuck inside the Phantom and it took an Act of Congress to get the battery back out. Hopefully I didn't damage anything inside. A bit worried. 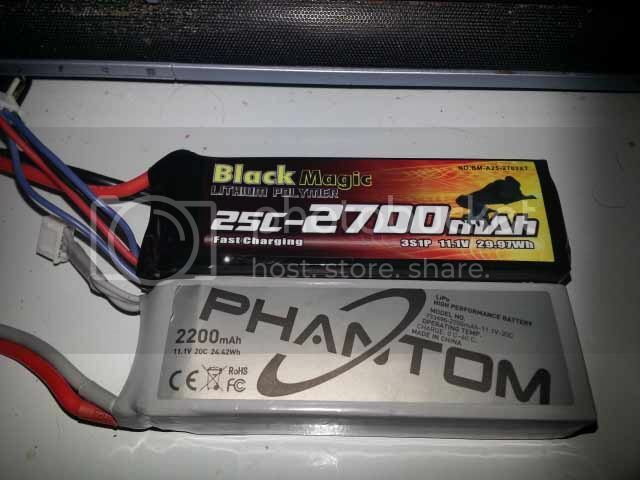 AVOID the Black Magic Phantom 1 "2700mAh" battery like the plague. Unless this particular battery is defective, Black Magic is a NO GO for me from now on. I sure wish someone else had taken the time to do this before I bought it. 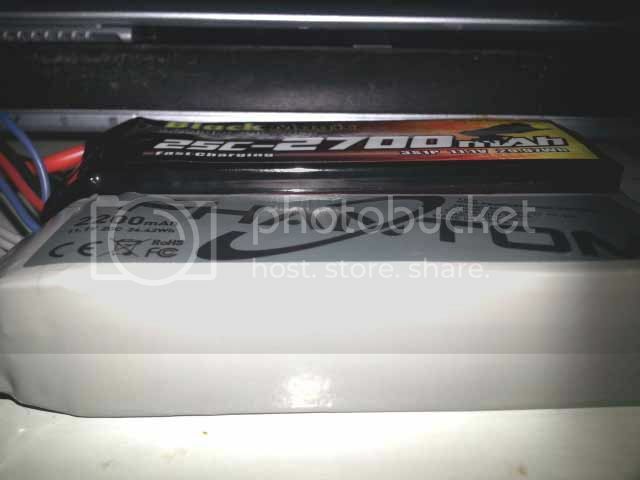 After I send it back, I'll try a MadDogRC 2700mAh Phantom 1 battery. Should be about a month to sort this all out, return this one and get the MadDog battery. If you don't understand Lipoly min/max voltage limits, cell balance and IR (internal resistance) testing you owe it to yourself to learn these fundamentals. YouTube has many IR testing videos and investing in a decent RC Charger is well worth it. Can we stick with performance of the BlackMagic 2700 vs the OEM DJI 2200 and leave the technical jargon for another thread please? There's hundreds of LiPo chemistry technical threads. DJI recommends cycling the LiPos for various reasons of which I'm aware and simply made general statements giving most people the benefit of the doubt that they know about LiPos and know what I meant. Like I said, I'm trying to save someone the hassle....not school anyone. Not in THIS thread under THIS context. And yes, I'm familiar with Google and YouTube and have read volumes on LiPos and I still might occasionally say something that's incorrect. Guess I'm human. 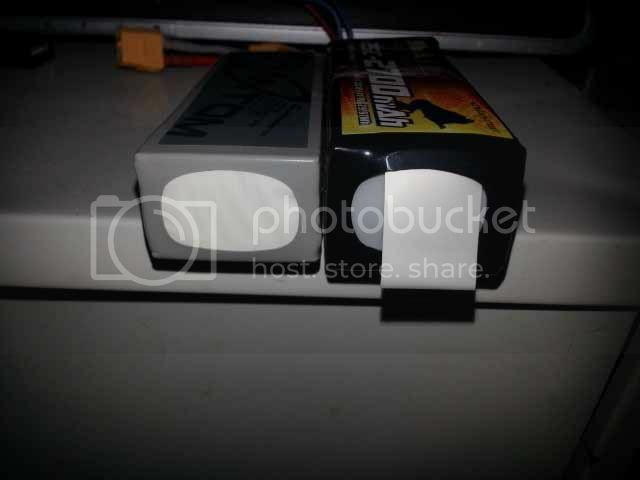 Do you have any experience with Black Magic batteries you can add? I haven't tried the 3000mAh battery. Maybe it's better than the 2700mAh battery. As far as easy to fit, I don't think it will fit without shell modification. The 2700 is a pretty tight squeeze and sometimes I had trouble getting the battery into the Phantom and back out. as far as I remember first I put the 3000mAh in wires first it went in ok there was plenty of clearance with the lipo but I didn't like having to bend the wires so later on all I done was to cut a small slot in either side of the door just enough to put the battery in wires facing out so now lipo in, shut the door, wires outside ready to connect when I'm ready to fly, it's a lot better that way as before by the time I'd got the battery in wires first and the door shut I wasn't sure about the green lights flashing twice, now as I do it I shut the door, then when I'm ready I connect the wires and I can then immediately concentrate on the lights.